OMA and Morphosis have unveiled their visions for Unicorn Island, a new technology hub proposed for Chinese city Chengdu, which are competing against two other yet-to-be-revealed designs. Four architects were named as winners in the Unicorn Island competition: OMA, Morphosis, Foster + Partners, and Arata Isozaki & Associates and Jun Aoki & Associates. But it is unclear at this stage which scheme will be taken forward. Set on Xing Long Lake, the project is an initiative from the Chengdu government to attract new technology businesses to the area. The aim is to create facilities for unicorns – startup companies with a value of $1 billion (£742 million). It forms part of wider drive to move China's economy away from manufacturing, towards knowledge and services. OMA and Morphosis have both released images of their designs, while the other two teams are keeping their under wraps for now. OMA's masterplan envisages Unicorn Island arranged in three consecutive rings, with an area called the Living Lab at the centre. This is described as an "innovation engine", providing companies with testing spaces where they could showcase projects to visitors. Encircling this would be the Weave Zone, an interlocking grid of offices, homes and amenities. According to the Rotterdam-based firm, this area would provide "generous opportunities for informal encounters", most likely via their plans for a system of raised and intertwined walkways criss-crossing the city. On the outer ring, theses walkways would lead into the headquarters of the unicorn startups, which would enjoy prize position on the island's waterfront. The Rem Koolhaas-led firm also imagines that a major road would run across the centre of the island, connected to the mainland by bridges on both sides. For Morphosis, a Los Angeles- and New York-based studio, Unicorn Island is imagined as a "walkable park city", where green areas would be intermingled with business zones. Flexible offices, high-end residential developments and areas for recreation would be arranged into four neighbourhoods, each designed to foster startup companies at different stages of their development. At the centre of an island, a soaring tower would define the island's skyline and provide premium office space for the elusive unicorn companies. 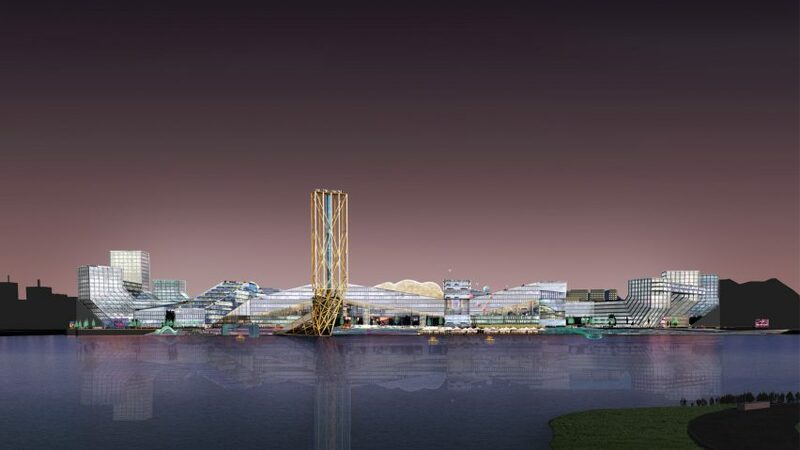 Tech islands and tall towers are a speciality for Morphosis. The Thom Mayne-led studio recently worked on the Cornell Tech campus on an island in New York's East River, and topped out a 350-metre-high skyscraper in Shenzhen. Foster + Partners and OMA have also both worked on plenty of large masterplans. Recent examples from OMA include a residential village for Facebook, while Foster + Partners recently revealed a masterplan for a new city in India, which is set to run on sustainable technology. The firm that wins the commission will be selected by the Tianfu New Area committee.